Aroma produces a wide variety of electric kettles with different features, sizes, and functionality. There are many Aroma Electric Kettle Reviews out there, and to have more opinions, I came up with this review so you be well informed when you want to buy an aroma water kettle. Some of the kettles include professional electric kettles, digital kettles, cordless, glass and stainless steel. With this much variety, it may be a daunting task to determine the one to choose. The best way to know the kettle you need is to assess your needs. With a capacity of up to 6 cups, the Aroma 1.5 liter Hot X-Press, silver, boils water at a high speed of a cup per minute. The kettle is cordless pouring for easy serving. Easy-to-use, one-touch operation. Automatically switches off when water boils. Ideal for a variety of uses like hot tea, soups, instant coffees, oatmeal, hot chocolate, noodles, baby formula and more. The kettle can accommodate up to 6 cups, unlike other kettles. The Aroma electric kettle is programmable with a capacity of up to 1.7 liters. This feature enables the kettle to be used to make different types of tea that require specific temperatures. It also features a window for indicating water level, an auto shut-off and it is cordless. It is silver in color and is made of stainless steel. This aroma tea kettle can be used for making different types of tea thanks to its programmable feature which enables the temperature to be increased in 10o intervals. It has a large capacity of up to 1.7 liters. You can see when the water needs refilling because it has a water level indicator and thus can prevent dry boiling where the kettle is turned on without enough water. It has improved safety with its auto shut-off feature that ensures that the kettle shuts itself off after the water attains the set temperature. This way, you do not need to worry if you leave the kettle on. Pouring the water is easy because there are no cords to deal with. It is beautiful with a stainless steel finish. The kettle gets hot on the outside when the water is heating. However, you do not need to touch it since it has a good handle. There is a high price difference between this model with programmable temperature and those that do not. You can make your specific tea using this Aroma AWK – 299SD Digital electric kettle because of its programmable feature. The kettle also comes with a sleek design, it’s fast in heating the water and can accommodate up to 7 cups of water. However, you pay a little extra for the programmability feature in comparison to other models without it. This cordless electric kettle can boil up to 7 cups or 1.7 liters of water for your tea, noodles or oatmeal and at a speed of a cup a minute. The kettle is made of steeland it’s red in color . It also features a lid that is easily opened by the push of a button, an automatic shut-off, and one-touch operation. The kettle boils water fast, saving time and energy. 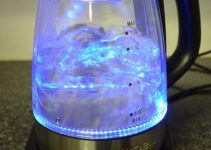 You can know when the kettle is heating water, thanks to its blue LED light. The kettle can be used to boil water for different uses, such as for making tea, noodles, and oatmeal. It is safe to use and you do not have to worry about it burning due to overheating because it has an automatic shut-off feature that turns the kettle off when the water boils. The kettle is cordless, which makes pouring easy and convenient and you do not struggle to get the cord of your way as you pour the water. Its lid can be opened with one hand because it features a lid with a trigger release that is opened with a push of the button. The pot does not have different temperature settings and, therefore, it’s only suitable for boiling water at a single temperature and not meant for making different types of tea. The price is high in comparison to other models that have better features. The Aroma 1.7 liter electric kettle, red makes the task of boiling water easier and faster. It is also safe to use because it automatically shuts off when the water boils. You can open and pour the water from the kettle with one hand and you don’t have to worry about a cord disturbing you. However, it may not be suitable for you if you prefer boiling water at specific temperatures. 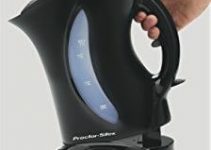 Of these reviewed Aroma electric kettles, the Aroma AWK – 299SD Digital electric kettle takes the first position due to its programmable settings. The second in line is the Aroma 1.7-liter electric kettle, red, because can boil a bigger capacity of water. The Aroma 1.5 liter Hot X-Press takes the last position because it is not programmable and does not have a keep-warm feature. It is not suitable for boiling water in a preset temperature. Please tell us your opinion about Aroma Kettles in the comment section below. Did you like my review? Show me some love and hit the social share buttons from the left. I will appreciate.